Back row L-R: Trisha Bise, Mari Heslinga, Zoe Abrams, Scott Kaneshiro. Front Row L-R: Val Kato (President), Caitlin Mizoshiri, Dari Ann Matsuda, and Rena Takushi (Scholarship Committee Chair). 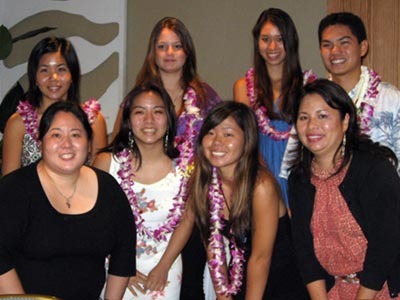 After careful deliberation, the Scholarship Committee (Pam Tamashiro, Ryan Okunaga, Reid Yamashiro, Ruby Uehara, and Val Kato, headed by chair Rena Takushi), selected nine outstanding recipients for the 2008 Hui Makaala Scholarship. These eminently qualified and exceptional high school seniors are academically talented and demonstrated a keen interest in the Okinawan culture. At the Scholarship Banquet on July 27, 2008, the graduates were encouraged by an inspirational talk by guest speaker, Jordan Segundo. Each recipient was presented with a $2,000 or $3,000 scholarship to be used towards his or her college education.